Mechanical, HVAC and Plumbing installations and repairs are the integral parts of our business. We specialize in the installation and repair of Mechanical (cooling towers, pumps, chillers, boilers piping), HVAC Systems and Plumbing Systems. Guranteed satisfaction is our number one commitment as we strive to keep our customers cool and comfortable in the summer and warm and cozy in the winter. The coordinated efforts of the estimators, project managers, and field craftsmen in this department have helped the company to offer the depth and diversity to become one of the main contractors of choice in our service areas. The estimators in all departments have the expertise to meet the plan/specification and design build market for a project. From start to finish, every effort is made to assure customer satisfaction. Our service department offers Corrective and Progressive Maintenance Services and Sales of mechanical, HVAC and plumbing equipment. Our technicians can service most existing systems installed by others along with systems that we have installed. Our Progressive Maintenanced programs offer services that help maintain the full function of equipment. We are dedicated to creating the best program which fits our customers' needs and budget. Corrective Maintenance service are available Monday through Friday 24 hours a day, 365 days a year. 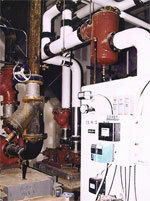 We have a large number of suppliers that we can call upon for Mechanical, HVAC and Plumbing equipment. We always do our best to offer quality products and equipment at competitive prices.